People often ask us about social trading with binary options. Social trading is not new, copying other traders’ trades can be done on Forex for years. But the truth is that we have never seen a single trader making good money in the long term thanks to social trading. We believe that social trading is not the right way, because you have no control over the trading system, you are just copying someone and that person could leave the system at any time. Moreover social trading on binary options is a lot less developed than on Forex and there is a lot of scams. 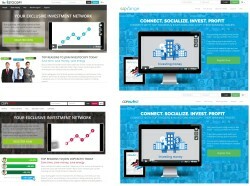 First we started to investigate the social trading program Investocopy. 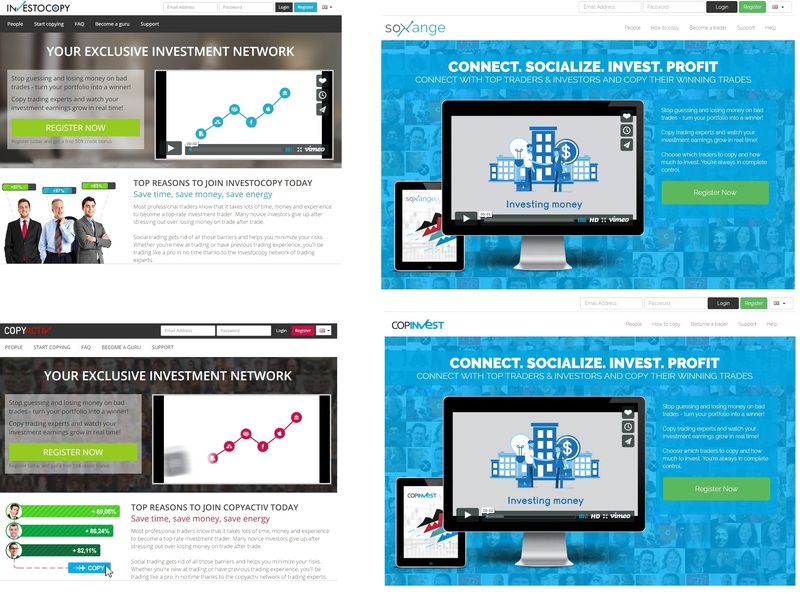 By doing so we soon found clones of this program: Copinvest, Copyactiv and Soxange. 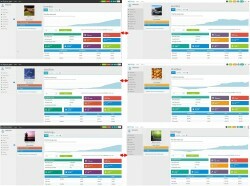 Look at the image, their home pages are very similar or the same. So we got the suspicion that it is the same thing. And we soon got a confirmation. 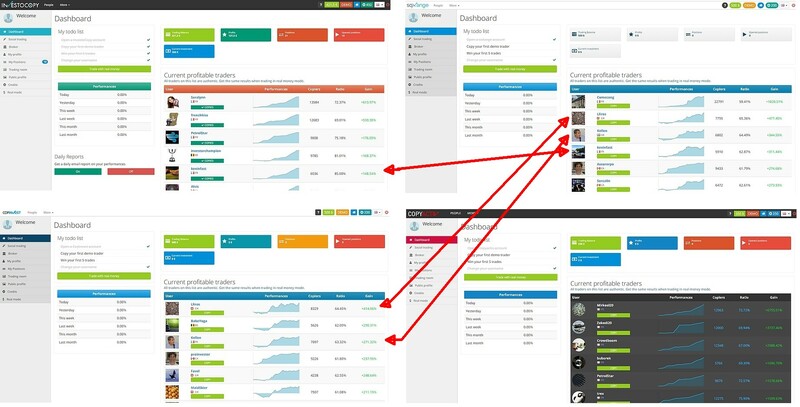 When you sing up with Investocopy, Copinvest, Copyactiv and Soxange, you’ll see that the trading platform is exactly the same, so there is no doubt that all these programs belong to the same person or company. The behaviour of the platform is always the same, you are told the same things, the functionality is exactly the same. So the question is, who needs to clone his trading project under four different names? Only scammers do that. 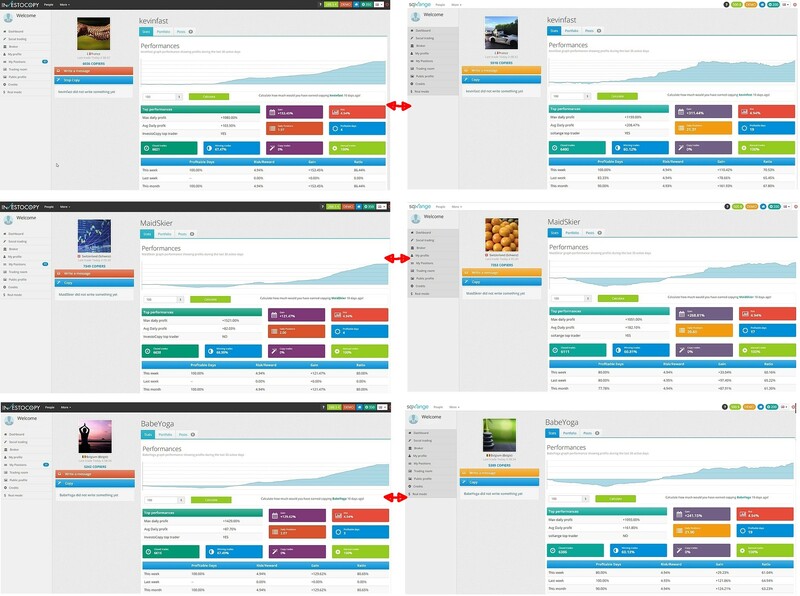 You might already have noticed it on the images, scammers even copied some of the traders between their platforms. The problem is that names and times of last trades are exactly the same, but performance numbers are different! There is only one possible explanation for this, these traders and data are fictitious. So you would be copying some random signals that have nothing to do with the performance numbers you are shown. We even tried to copy some of these fictitious traders to see what happens. 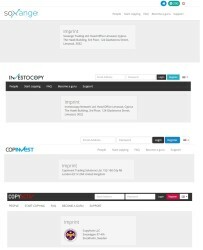 And we got another confirmation that Investocopy, Copinvest, Copyactiv and Soxange are a scam. Because when trades are open by the platform, the expiry time of the options is not shown, so you cannot independently verify what the results should be. Again, the only explanation is that it is all fake, the results are faked to make you believe that these fictitious traders are profitable. 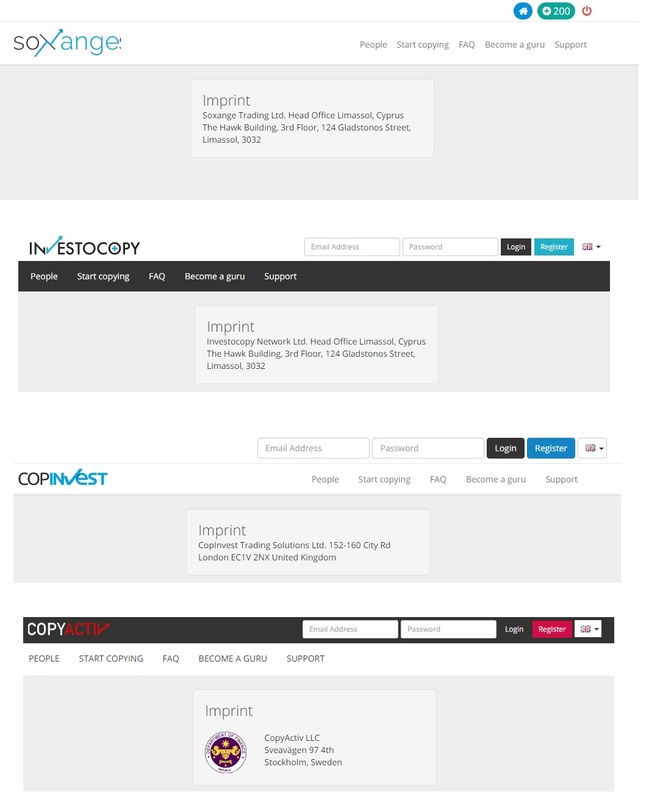 Investocopy, Copinvest, Copyactiv and Soxange don’t provide the same addresses, but each of them is allegedly based in an EU country. Therefore they should all be regulated. But we made a research and found no information about regulation or licences of these companies. So we have every reason to believe that they do not exist. Investocopy, Copinvest, Copyactiv and Soxange are the same binary options scam that can make you lose money through copying some random trading signals, so stay away. If you want to try real binary options trading to see how you can make money in it, do it on a free demo. On a true demo with a regulated broker to be sure that you see true results.